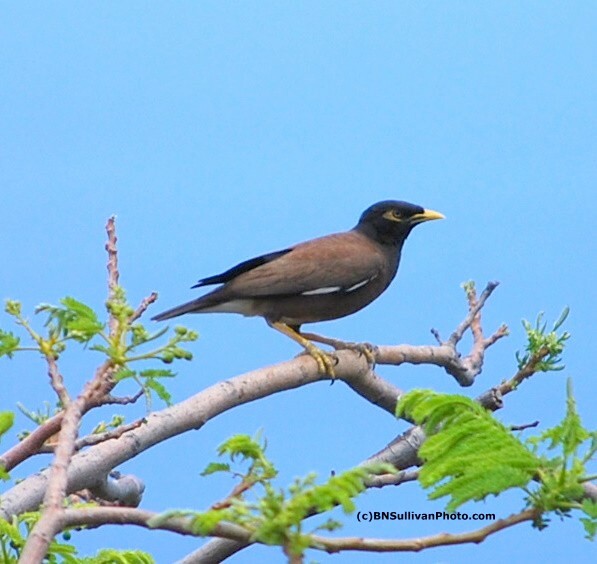 According to the Hawaii Audubon Society, the Common Myna (Acridotheres tristis) was introduced to Hawaii from India in 1865. Mynas are abundant in our area. This individual and its mate live in our garden. We call the pair "Heckle and Jeckle." I know that the cartoon Heckle and Jeckle were magpies, but the names seem to suit our Mynas. They can be quite comical. They have a goofy gait: instead of hopping like so many birds do, they walk (and sometimes run), one foot at a time. They perch in our trees and on the peak of our roof and behave like bossy overseers. They screech at us when we walk through the garden and scold the other birds that come to our feeders. I remember seeing a myna bird is a store once. It was a pet of the store owner. This is a great shot and thanks for the info on it! A beautiful clear shot of the mynah. These birds are absolutely everwhere aren't they! weren't heckle and jeckle crows tho? Great capture of that mynah! @ 2Sweet - Thank you. Your comment reminds me that I haven't seen a caged myna in years. @ Baruch - Thank you. I don't know about your corner of the planet, but we certainly do have a lot of these birds in Hawaii. @ Soapbox - Technically, the cartoon Heckle and Jeckle were supposed to be magpies, according to Wikipedia (follow the link in my post). But hey, they were cartoons, so who cares! @ Kay - Thank you. What a beauty! I love it so much and I think you are a professsional photographer. Well done. I had one in my blog, kelicap.blogspot.com, but not as good as yours.